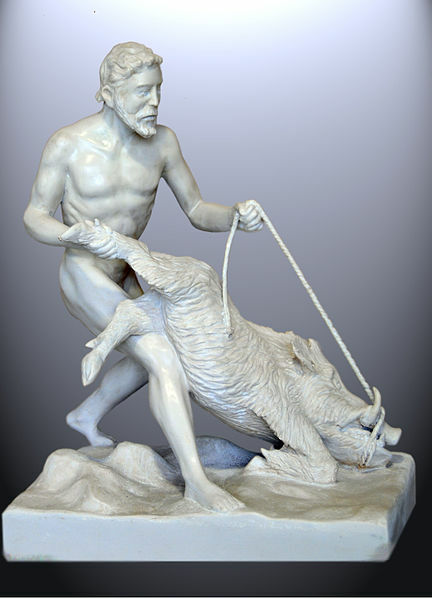 Heracles (Hercules, in Latin) is considered by many to be the greatest of all Greek mythological heroes. The son of Zeus and a mortal woman, he is hated by the goddess Herra, the wife of Zeus. Her attempt to kill him as an infant is thwarted when he strangles the poisonous snakes she places in his crib. By use of a potion, she later tricks Heracles into killing his wife and children; when the effects of the poison wear off, he is struck by grief, and agrees to undertake twelve impossible trials given him by the jealous Herra to earn redemption. Heracles, however, undertakes all of the seemingly impossible tasks, conquering them one by one, battling fierce lions and serpents, moving earth and rivers, and then descending into and returning from Hades for his final trial. Upon completion, he walks into a burning pyre and is reborn into eternal life as a god. The finale represents the death of the Ego, and our rebirth as a hero who lives in service of the divine – the Soul.